You never know where the next gig is coming from—maybe it’s joining a disco revival tribute band, being asked to play guitar on a remake of Shaft, or getting a quick $200 from a YouTube producer to come up with a background theme for their “Remembering the ’70s” docu-series. What do all of these have in common? Yes! The magic of the wah pedal. A mint condition Vox Crybaby pedal can sell for up to a grand, but no worries—this Friday’s tip reveals the “secret sauce” for getting a can’t-tell-the-difference-from-the-real-thing wah pedal sound. Now you might say “C’mon Craig, try to come up with something better next week, okay? It’s no big deal. You just put a ProEQ parametric stage in your guitar track, set it to a relatively high Q, and vary the frequency.” But actually, it’s not that easy. A real wah doesn’t just have a peak that pokes its head up in the middle of the frequency spectrum, but has steep high and low frequency rolloffs on either side of the peak—and we can do that with parallel processing. Set up a Splitter in Normal split mode. Insert the ProEQ in one split, and the Mixtool in the other split. 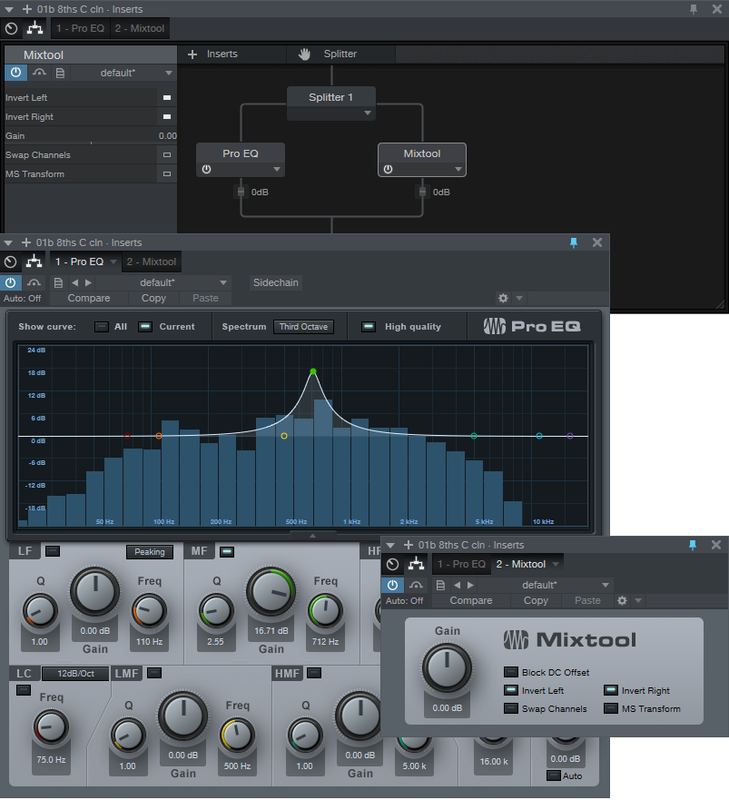 Invert both the Left and Right channels in the Mixtool. If you play guitar through this, you should hear nothing because the out-of-phase MixTool is canceling out the audio. Create a parametric peak. You’ll want a fairly high Q and gain, depending on which wah you’re modeling. Now sweep the frequency back and forth, and you’ll swear you’ve been transported back in time to when wah pedals ruled the earth. This is due to the cancellation on either side of the peak from the Mixtool being out of phase. And by the way… wahs can also sound great in parallel with bass, and in parallel with drums when you want to add a dose of funk. So don’t spend a grand on a vintage wah—just make your own with Studio One. I have been researching PreSonus and can’t find out how to get the splitter to come up in Studio One 3, I guess that means I would need to update to Studio One Professiona? In fact…I’ll do next week’s tip on how to use pedals to control effects and others parameters, and explain it step by step. Thanks for the idea! You need a pedal that can generate MIDI controller data. Many multieffects floor units have pedals that generate controller data. Also, many keyboards have a footpedal jack and the moving the pedal will not only control a keyboard parameter, but also generate a MIDI output. Now all you need to do is assign the EQ frequency control to the pedal, which is done through Control Linking (read the documentation about control linking for details). There are several ways to do control linking, I like the simplicity of right-clicking on a control, moving the pedal, and then linking the two. BTW, PARIS still has some loyal fans, one of whom wrote an ASIO that allows people to use the legendary (?) PARIS hardware with Studio One, but only when running 32-bit. Anyway, thanks for the reply, and for everything you’ve contributed to music and music making tech over the years. I was 23 when I was building that opto-isolator compressor I used live on my guitar for years, so you’re probably not THAT much older than me. I’m Brazilian and I like to accompany your things here … I made the chain of your wha-wha and I loved it !!! but I need to know if you have how to make the pedal effect stepping up and down? Well hi Sarah! You think YOU’RE old…anyway, the signal is going through the Mixtool, but it’s out of phase with the other split. So what the splits have in common (everything but the parametric peak) cancels, while what the splits don’t have in common – the parametric peak – produces the wah effect. Make sense? We’re old friends, though we never met. But back in 1976 (yeah, I’m that old), I stayed up till sunrise quite often, with my little black and white TV on, building almost everything in your Electronic Projects for Musicians book. I love the smell of solder. Then I saw you in Portland around 1998 telling us all about Ensoniq PARIS, which I proceeded to record and mix a lovely album on. (sarahtonin1.bandcamp.com) So thanks for all that fun, and for all these groovy Studio One tips. Question: I did a wah-wah effect like this with just the Pro EQ and an automated sweep. I’m not getting how, if there’s no signal getting through the Mixtool, how is that any different than it not being there? There isn’t a video, but what do you want from a video? What it sounds like, how it was put together, the process of creating an FX Chain…?